Presently, the existing green fluorescent materials are rare earth luminescent material, which cannot reach the requirement of inkjet ink on dispersion and stability because of the inferior solubleness. 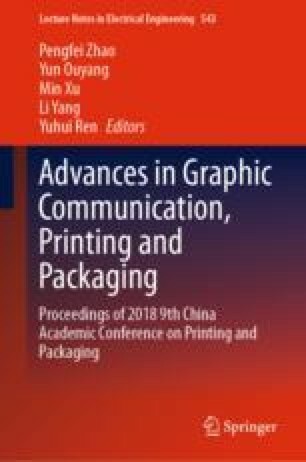 In this paper, the fluorescent inkjet inks were prepared by anthracene-based derivatives, ink’s printability was tested and the relationship between molecular structure and ink’s printability was researched systematically. Finally, the optimal formula of green fluorescent inkjet ink was obtained. The results showed the photophysical properties of proofs a–c had obvious change comparing with inks a–c and the contact angle of ink d was the biggest of all due to the planar construction of fluorescent material with large conjugate degree. The green fluorescent material: 9, 10-bis (4-methoxyphenylethynyl) anthracene with 0.5% and crylic acid B817 with 12% formed the optimal formula. The printing quality of ink prepared by the optimal formula can accord with the demand of digital printing quality. This study is funded by the Scientific Research Common Program of Beijing Municipal Commission of Education of China (Nos. KM201810015012, KM201810015003).